Local softshell clams are displayed at a Portland, Maine, fish market in this 2017 file photo. Maine's clam harvest is dwindling. 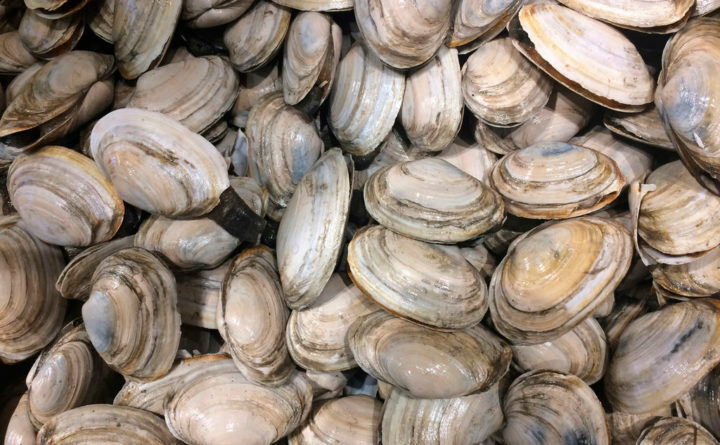 The Associated Press reported earlier this month that Maine harvested about 1.4 million pounds of soft-shell clams, the lowest harvest since the 1930s. This also was less than half a typical haul in the early and mid-1980s, underscoring the folly of Rep. Bruce Poliquin’s proposal to open Acadia National Park to commercial harvesting of clams and worms. Acadia should be a small but vital refuge from commercial clamming and worm harvesting. As we have maintained, the park’s few intertidal resources were set aside for resource protection, even from traditional uses, so that a bit of nature in Maine can be seen, studied and maintained unimpaired for present and future generations. We believe Acadia’s role as a natural laboratory would be much more beneficial to the long-term sustainability of Maine’s clams — and clammers, for that matter — than opening the park for the convenience and commercial gain of a few. To protect native ecosystems, national park policies call for aggressive protection of native species against invasive plants and animals, and the park can play a strong role in supporting research on the exclusion of invasive crabs that, along with natural predation and commercial harvesting, are reducing clam populations in Maine. While pollution is yet another factor, progress in cleaning up and re-opening polluted areas without applying invasive species control techniques does not seem to be enough to maintain clam harvests. We believe Poliquin’s bill and Sen. Angus King’s companion bill are ill-advised. While these bills might benefit a few financially, at least in the short term as would any commercial exploitation of a national park, it will not benefit anyone in the long term, and we think it will harm future efforts to maintain national parks with their resources intact insofar as possible. There are many constituencies who wish for legislation that gives them commercial access to America’s national parks. Every successful effort to legalize commercial use of national park resources makes it harder to defend against the next. While Poliquin’s bill has now passed the House, we believe changing Acadia’s 100-year-old protective legislation is a bad precedent and bad public policy. Without this new legislation, the park can become a catalyst for understanding how to maintain clam populations that will support sustainable commercial harvesting and jobs in Maine communities. We believe a far better outcome would be strengthening the scientific and educational roles that Acadia can play in restoring the historical bounty of Maine’s coast. It’s time to develop new approaches and new traditions that can restore the natural bounty that previous generations of Mainers witnessed. This would benefit not just a few, but all of us — and future generations as well. Michael Soukup is a former associate director for the National Park Service and lives in Blue Hill. Mary K. Foley is a former regional chief scientist for the National Park Service and lives in Carrabassett Valley.